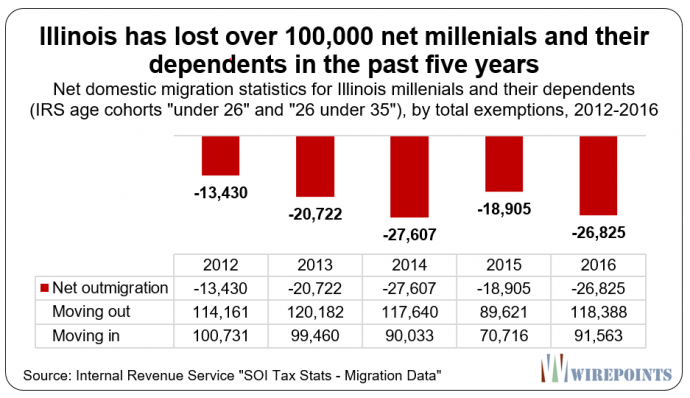 Don’t expect Illinois millennials to ignore the state’s collapsing finances for long. They’ll soon be asked to bear more and more of the financial and economic costs, from higher taxes to diminishing job prospects to cuts in funding for their kids’ schools. That’s when Illinois’ millennials will either fight back, as they’ve done on many national issues, or they’ll simply leave the state. It’s that simple. Dowling calls for Illinois millennials to get engaged. Kudos to him for the wake up call. Next articleIt’s the pension promises, stupid!